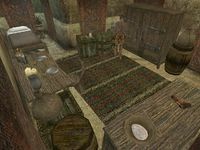 The St. Olms Canal South-Three is the residence of Achel accessed from outside and located on the Canalworks level in the southern part of the St. Olms canton in Vivec. There is a variety of containers, such as cloth sacks, crates and barrels, containing mostly random ingredients and cheap food. 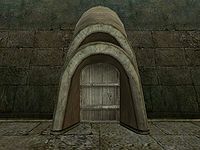 The only exception to this is a crate along the western wall, just next to the dining table, which contains up to 10 gold (60% chance each) and also has a 25% chance of storing an restore attribute potion, as well as a small chance of containing random special and marksman loot. There are a total of 11 gold coins lying on top of it. To the left as you enter is an empty dresser, on top of which lies a pair of common pants and a small kwama egg in a bowl. In the northwestern alcove is a single bed owned by Achel.